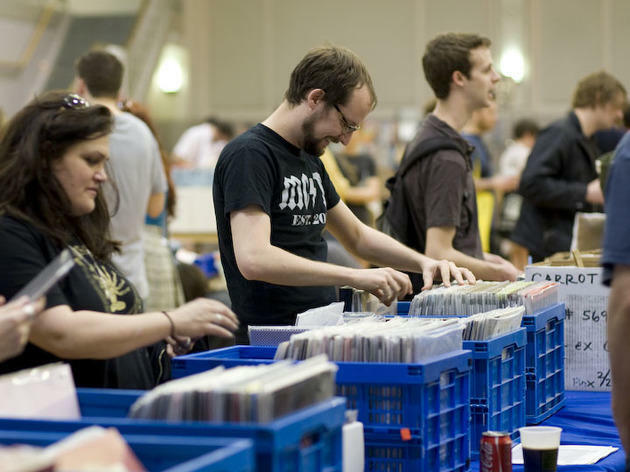 This year's edition of the CHIRP Record Fair avoids the Record Store Day fray by moving to the first weekend of May. 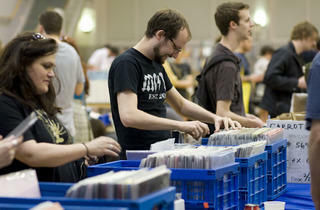 Attendees will find more than 100 tables hawking vinyl at the fair, in addition to DVDs, CDs and posters. Don't feel like shopping? Show up to catch live sets from acts like OVEF OW, The Jellies and Baby Money or stick around to Van Paugam, Miss Alex White and Metro founder Joe Shannahan spin some of their favorite records. Plus, you can sip beer, cider and cocktails while enjoying food from Taco in a Bag and Conscious Plates. The first 500 guests score a free tote bag and a $25 ticket will get you into the fair two hours before it opens to the general public (at 10am). This is the perfect event if you're on the hunt for hard-to-find vinyls ... or just want to see a bunch of hipsters digging through records. I enjoyed the downstairs of Plumbers Hall (featured vendors from Vintage Garage) much more than upstairs (mainly records, the occasional poster or cardboard cutout for sale). Music junkies would love this, but I really just went out of curiosity. They sold tamales, beer and featured live music as well. Not a bad daytime event if you're looking for something different to do in West Loop.